Get up close and personal with these 3 x exciting new vehicles. Several heritage cars from the Subaru Museum also on display. Meet Molly Taylor, the 2016 Australian Rally Champion. Buy STi merchandise & accessories. Subaru Sales staff available to answer any questions. Vehicle Test Drives available on the night. VIP Prices on the night. Food Trucks onsite selling food & drinks. Top Deck car park exclusively for Club Member Car Display! So give your pride and joy a once-over and proudly show it off to all in attendance (including Subaru invited customers). 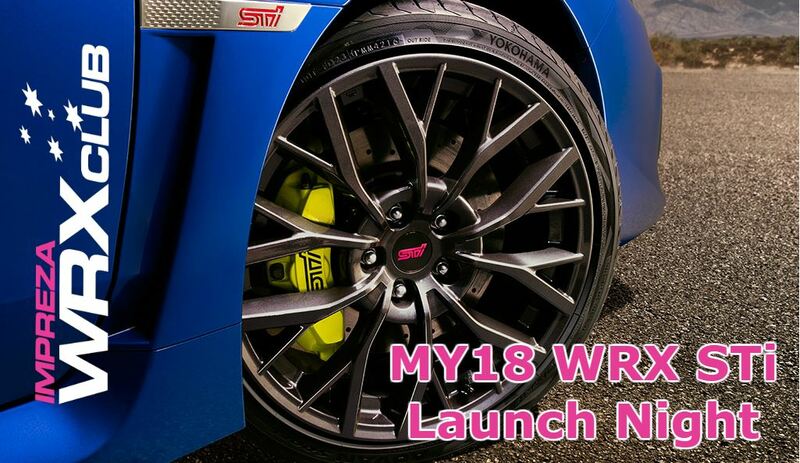 The Committee invites & welcomes all WRX Club members, guests & non-members to join them for this exciting evening. Otherwise, there will be Food Trucks onsite selling food & drinks. In the surrounding streets, unless you're a club member wanting to display your Subaru on the upper level/top deck car park, which is on a "first in best dressed" basis.